It's our last night in the Galapagos. We had a glorious last day of diving. Yes we dived the last day. I was not sure I was upto it but D was set on doing Gordon's Rock. Yesterday, evening we were strolling on Darwin and there was a big sign outside one of the dive shops offering a special on Gordon's Rock. D asked a few questions and we were pretty doubtful because they weren't absolutely certain they would do 1 or 2 dives there or at Seymour. He said that he would only go if they would absolutely do 2 at Gordon's as did another rather crabby gentleman in the shop at the same time. Actually, it worked out because we did not have to fuss at all, he did all the complaining because he had already paid. They had enticed D with the photos of their Gordon's dive that day with schools of Hammerhead Sharks. One thing that I am a sucker for is missing out on excitement. The agent promised to have extra dramamine for me on the boat. So I signed up. In the end, we did see quite a few Hammerhead Sharks but no schools that day. I did say glorious because we did see some amazing things but 1 thing in particular. 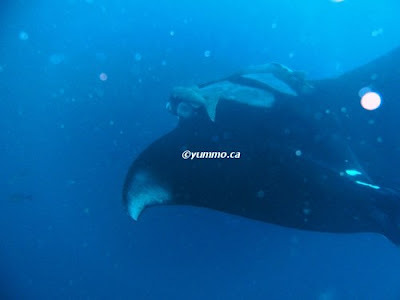 As we were rounding a corner, a gigantic Manta Ray with a 6 m wing span was turning the other way. He caught us all off guard. I wasn't even sure what I was seeing. I thought it was a whale at first. It was enormous. There were four seasoned divers with us including D. Everyone on that dive, except me, had nearly a hundred dives. They were all awestruck. I was petrified. I filmed him for a bit but when it looked like he was turning back, I swam away. He was just changing direction. The one crabby man, followed him for a while. As it turns out he was a marine biologist. Had I known that, I would have followed as well. That all said and done, I would NOT RECOMMEND Shark Friends Diveshop. I really would strongly advise against it. They have Padi Certified Dive Masters but they are not a Padi shop. There is a key difference. They are not held accountable to any standards. Myself and another diver had stale air. It tasted like a musty closet. I had remembered in my lessons that that was not a safe thing and you should NOT dive with stale air. But since I had not dived that much, I did not know what 'bad' tasted like. I looked around and all the other experienced divers did not seem fussed. I knew we had a limited amount of tanks so I did not say anything. I had a headache after the first dive which subsided over lunch but then it came back with a vengeance on the second dive. I was not the only one. D said that happens when people refill tanks without bleeding out the remaining air. As well, they had a disovery diver on the boat with us that was obviously not instructed properly and did not even know that he should have cleared his ears the whole time. Poor kid asked me at lunch "J, if I can't clear my ears but I can still breathe, is it safe?" I said NO! You need to keep trying until you clear your ears. Rise a bit and keep trying. You can severly injure your ears if you do not. That Discovery Diver should not have been at Gordon's Rock. I wrote Padi but they said as they were not a Padi Certified shop they could not sanction them, that is, unless the shop had advertised themselves as a Padi shop or if the Discovery course was advertised as a Padi course. Anyway, be cautious, read reviews, check with Padi.com and do not dive with shops like "Shark Friends" that are not held to any standards or quality levels! We were exhausted and famished after that day. D was down way too long on the second dive. He was just so thrilled ot be at Gordon's Rock he pushed too far considering we had a flight the next day. Even the Primary Divemaster was muttering under his breath that D and the other Master should have not stayed so long. The watches are conservative but we were down to the last minute on safety for flying after a dive. We went down the road to Garrapata for dinner. We noticed it had seen a decent crowd every night and during days. That could be on account of the listing in every guide book and the free working Wifi. It is an open patio Grill Restaurant next to a Disco and a Church. Yes, I am serious. There was a loud raucous bar next to a small church advertising temperance. Awesome. We sat in view of the grill so we had what the Galapagos should be best at, grilled seafood. D had the Mixed Seafood Special on a mini chafing dish with coals inside. I had the Ecuadorian Grilled Tuna. It is absolutely confirmed in my mind that Ecuadorians simply like to thoroughly cook their fish. The tuna was very over done. If it were not for the sauce, it would have been very dry. The same for D's grilled mix. Still, it was a lovely evening, we had a bit of wine called Sunshine and the service was friendly and attentive. I might have thought after a while not to over cook our fish but each evening we seemed to tired to be that aware as well did not want to be rude in another country. Particularly when the dish is called Ecuadorian style fish, who am I to say how it should be cooked? Well, I think I would have enjoyed it more a bit pink in the middle. 2c.